To reflect the needs of a diverse global market, companies need to encourage diversity and inclusion within their own organizations. Along with creating a more representative workforce, diversity also helps to build a more successful company. A two-year research study by Deloitte shows that companies who embrace diversity and inclusion in all aspects of their business statistically outperform their peers. 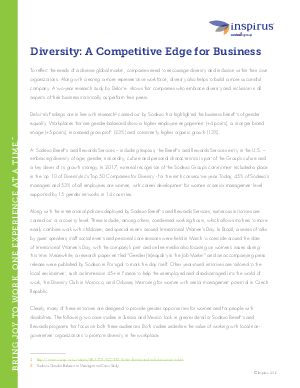 Deloitte’s findings are in line with research carried out by Sodexo that highlighted the business benefits of gender equality. Workplaces that are gender-balanced show a higher employee engagement (+4 points), a stronger brand image (+5 points), increased gross profit (23%) and consistently higher organic growth (13%). Read this whitepaper to learn more about the ancillary benefits of adopting diversity programs for your workplace!